Does each species have an optimal form? An ideal beauty that existed prior to the Fall? These were questions that concerned both artists and breeders alike in the 17th century. Dániel Margócsy on the search for a menagerie of perfect prelapsarian geometry. 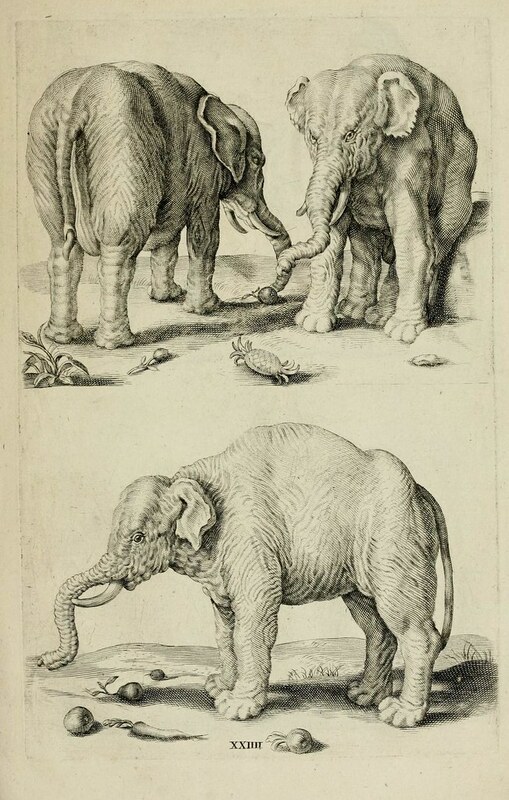 Crispin van de Passe’s perfect elephant as featured in his ‘t Light der teken en schilderkonst (1643) — Source. What does a perfect elephant look like? This was a question that occupied the Flemish artist Crispijn van de Passe II in the years around 1620. By then, several elephants had visited the European continent. In the 1510s, an elephant named Hanno was brought to Portugal from India and then presented as a gift from King Manuel I of Portugal to Pope Leo X. In the 1550s, Suleiman traveled through the Iberian peninsula and Italy, died in Vienna, and was stuffed and exhibited in Munich for centuries. A couple of years after Suleiman’s death, Emmanuel traveled through the Low Countries and Austria, and the list goes on, relentlessly, until we reach Hansken, the elephant that Rembrandt famously pictured, and whose skeleton is still exhibited in Florence’s Museum of Natural History. Before de Passe, no one thought to establish an ideal norm for what the average or canonic elephant might look like. Not that Passe’s aim was to synthesize previous sightings of the animal. While an extensive number of elephant prints survive from the sixteenth century, it is unlikely that he was familiar with all of them. Instead, Passe relied on the rules of geometry. With the use of squares and circles, he constructed an animal that conformed to the laws of mathematical proportions and published the results in his book ‘t Light der teken en schilderkonst. 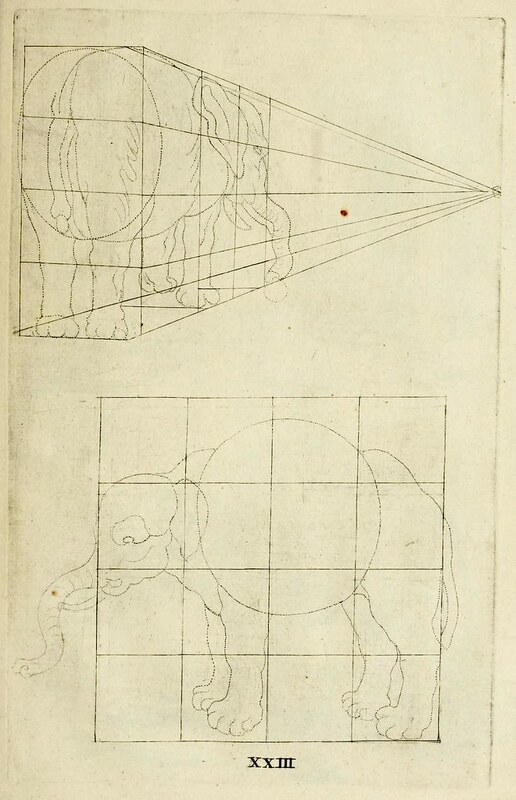 Crispin van de Passe’s grids for his perfect elephant as featured in his ‘t Light der teken en schilderkonst (1643) — Source. By the 1620s, artists had long used the laws of proportions to construct human figures. Their aims were often twofold. The use of squares and circles allowed apprentice artists to quickly learn how to sketch convincing figures, and it also helped establish a standard and idealized understanding of what the human body should look like. Most of us are familiar with Leonardo’s drawing of the Vitruvian Man, which illustrates the idea that the relationship between the body parts of the ideal human being could be expressed in simple, mathematical terms. From the early days of the Renaissance, art theorists such as Albrecht Dürer discussed in great detail how the ideal human being’s height was equivalent to seven, eight, or nine times the length of his head, and how the length of the arm, the legs, the chest, and other body parts could also be expressed as integer multiples (or simple fractions) of the head. 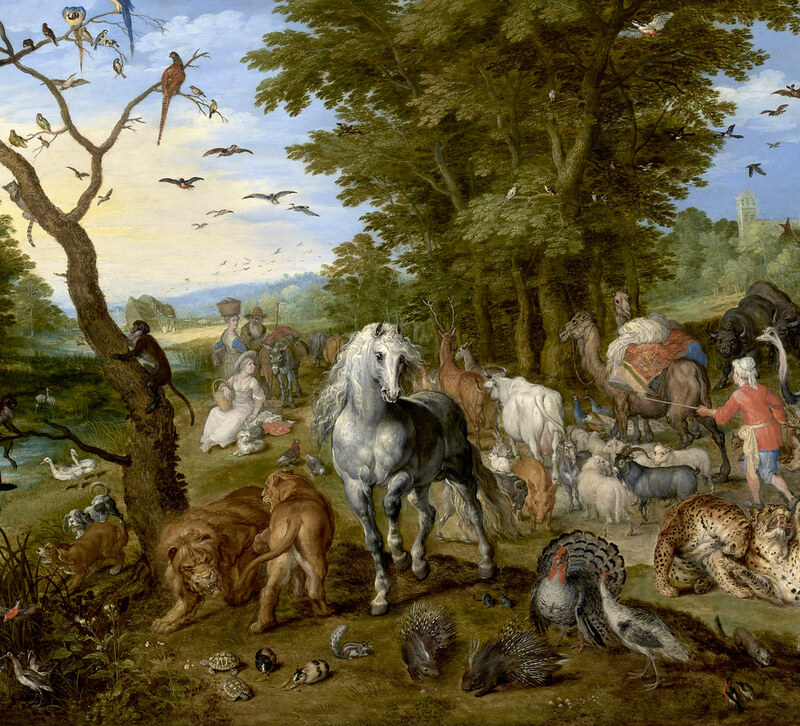 Painters applied the same insights to the study of animals. Dürer’s Knight, Death, and the Devil famously pictures a geometrically constructed horse, and he even intended to publish a whole treatise on the topic, which was pirated soon after his death in 1528 by Hans Sebald Beham. Beham’s Maß oder proporcion der ross would soon be followed by the model books of the German printmakers Erhard Schön and Hans Lautensack. Each of these artists came up with a subtly different solution to picturing a proportionate horse. For Beham, the abstract horse could be constructed in a few steps, starting with a large square, divided into nine small squares. Into this grid he introduced numerous smaller geometrical forms and then inscribed his ideal horse into the carefully measured plane. 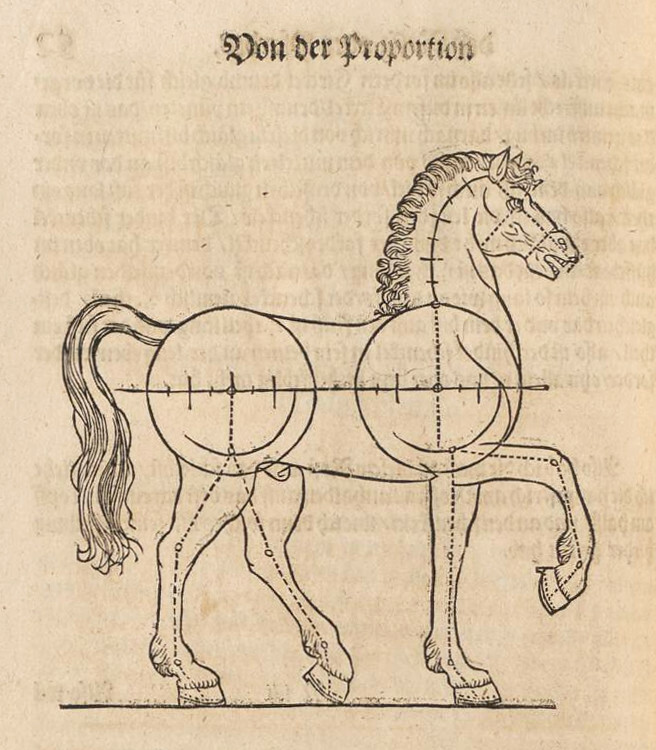 While Beham was interested in establishing the mathematical proportions of the lateral horse across a plane, Erhard Schön extended these considerations to three dimensions. 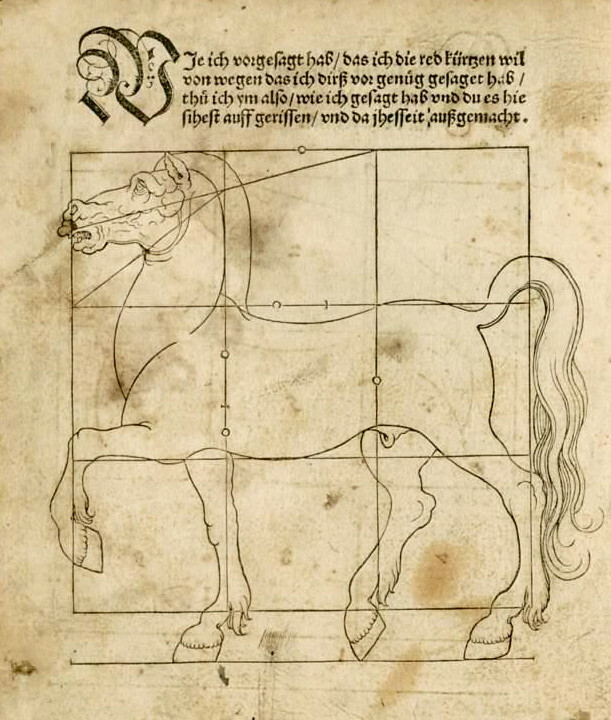 Unlike Beham and Schön, Lautensack did not think that the horse needed to be inscribed in a previously established geometrical plane or space. One could simply construct it by drawing two circles of equal size next to each other, one for the frontal part and one for the buttocks, and then by drawing a set of straight lines that determined the length of the legs, the neck, and the head. Passe’s innovation was to extend the repertory of animal figures to elephants as well as to bears, lions, or rabbits. Yet, for Passe, as for his predecessors, the question of the horse was even more pressing than that of the elephant. Building upon his predecessors, he carefully analyzed the proportions of the horse in a series of images, both in two and three dimensions, paying special attention to the shape of the head. 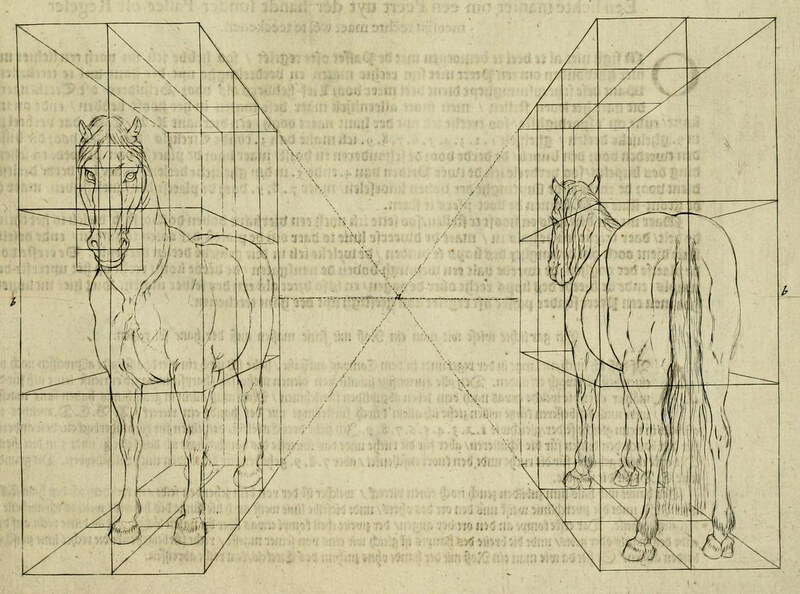 Grids for a horse from Crispin van de Passe’s ‘t Light der teken en schilderkonst (1643)— Source. 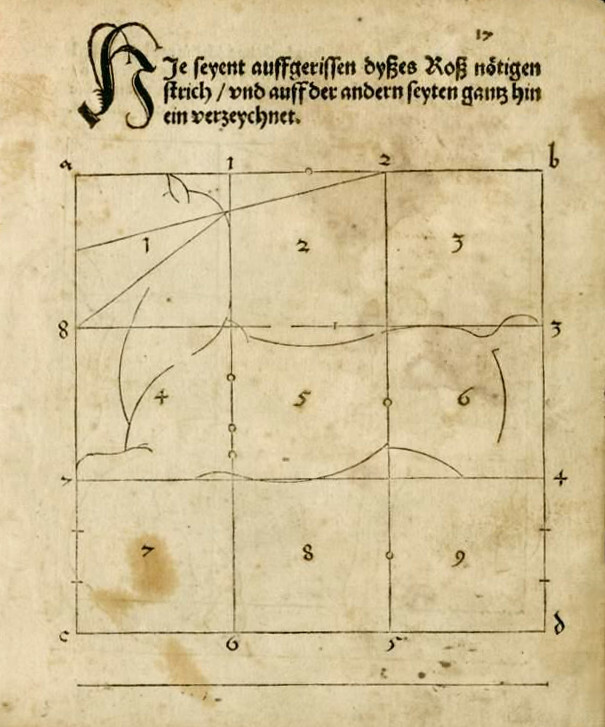 Grids for a horse’s head from Crispin van de Passe’s ‘t Light der teken en schilderkonst (1643)— Source. The geometry of the horse was crucial for Passe, whose personal life and profession brought him into daily contact with the animals. He was earning his living by offering lessons at the renowned riding academy of Antoine Pluvinel in the old palace of the Louvre. One may venture the thought that his students were probably more interested in riding than in limning elephants. Passe was also the illustrator of Pluvinel’s Maneige Royal, the crowning achievement and theoretical condensation of the riding master’s work; he saw it through the press after the author’s untimely death. 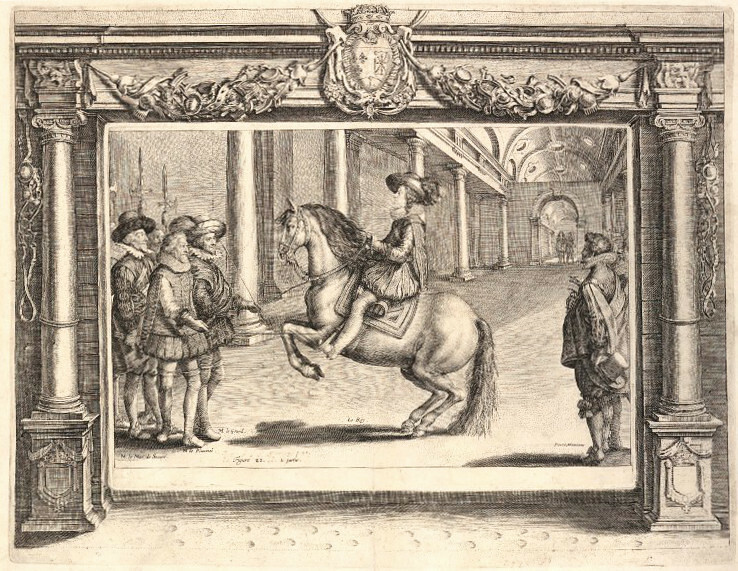 Our Flemish artist peppered the Maneige Royal with images of perfectly proportionate horses, on occasion explicitly borrowing from his ‘t Light der teken en schilderkonst. Considering Passe in his time, his focus on horses makes a lot of sense. Horses were, after all, the most important animal in the early modern period. They were the primary means of transportation, a significant source of agricultural labour, and, for aristocrats, a prime fashion object. Picturing them, therefore, was an essential part of any artist’s repertoire. Moreover, horses were highly diverse. By the end of the sixteenth century, Europeans were familiar with dozens of different breeds, ranging from Frisian, Burgundy, and Crete horses to Barbs, Turks, and Arabs. When the Flemish artist Jan van der Straet (Stradanus) was commissioned to portray the horses in the stable of Don Juan d’Austria, he was able to picture forty different breeds, including Armenians, Apulians, and Saxons. While in those days, nobody made a distinction between Asian and African elephants (even Linnaeus, the eighteenth-century founder of taxonomy, would remain ignorant of their differences), Passe was surely familiar with the dozens of horse breeds that his customers were riding. Pictures of proportionate horses offered the hope of establishing an ideal type for the species. Early in the sixteenth century, Lautensack had already pondered this possibility. He admitted that his geometric horses could not be representative of all breeds. While Italian horses were “rather handsome, with round, broad bodies and a small head”, the Turkish horses were “scrawny”, and the bodies and haunches of Frisian horses were large and heavy. 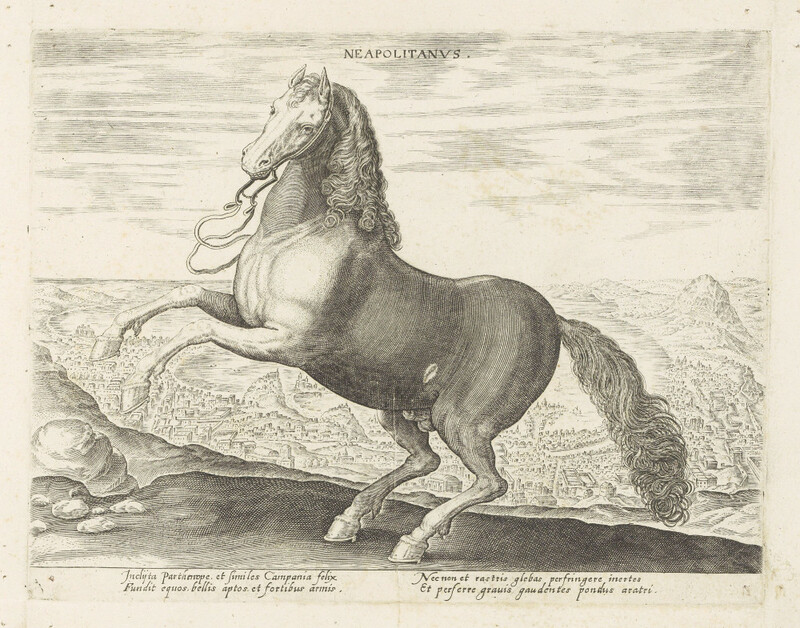 Lautensack’s beautiful, proportionate horse could stand in for a beautiful race, such as the Italian, or posit an as yet unattainable ideal, but it did not represent the species in all its diversity. 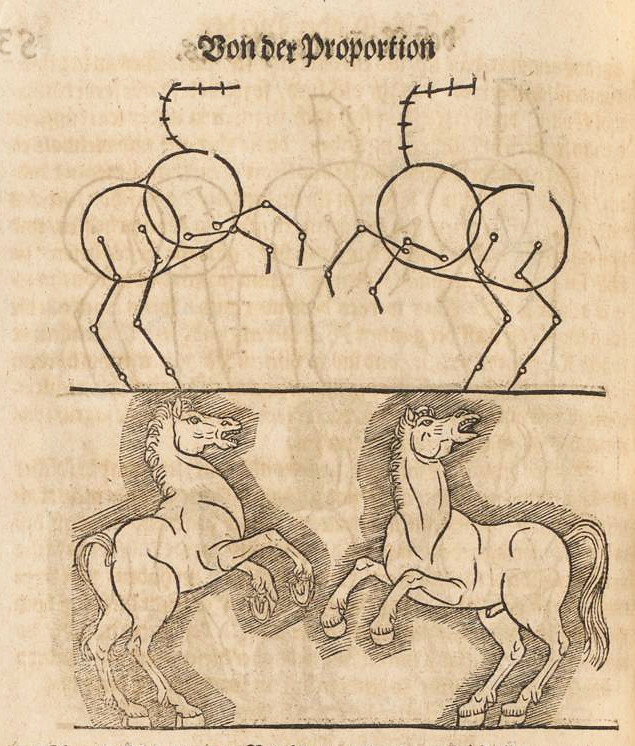 Yet if not all horses followed the ideal rules of geometry, could they be remade to conform? This was the key issue for horse breeders in the decades before Passe came onto the scene. Consider, for instance, the polymath Thomas Blundeville from Elizabethan England. Like Lautensack, Blundeville’s aim was to determine how the geometrical abstraction of the ideal horse related to the observed variability amongst actual horses. What made a species a species? though God almightie hath created all men of one selfe bloode, and that all doe take their beginning from the Arke of Noah, and that all men be one selfe qualitie and shape of the bodie, yet they differ in greatnesse, in proportion of members, and in colour. As animals multiplied and dispersed after the Flood, their size, proportions, and colour began to diverge. It was thus imperative to figure out which breed had the best, most beautiful proportions. In his Foure Chiefest Offices belonging to Horsemanship, Blundeville investigated the characteristics of horses from Turkey, Barbary, and Europe, and concluded that the courser of Naples was the best, as “his limmes are so well proportioned in euerie point”. Because of this quality, the Neapolitan horse stood out from the rest, and Blundeville proposed to import this breed to England to rejuvenate local stock. Detail from Noah’s Ark (ca. 1628) by Roelant Savery — Source. the Napolitan although he be bred under a hotter climat, yet that region is very temperate of it self, and so fruitful, as it is called the Garden, or Paradise of Itale: and the Horses there bredde, be of so strong and healthful complexion, as they wil not quaile wheresoeuer they go: and that they prosper so wel heere in this land, as in any other foyraine country. Neapolitanus (ca. 1624) from the workshop of Philips Galle — Source. For although God gaue unto Horses such excellent qualities at their Creation, now are they changed in their use and are become disobedient to man, and therefore must bee subjected by Art. The art of horsemanship could reverse the fall of humankind and create anew the perfect horse that obeyed humans — a horse that was proportionate, of course. Baret therefore set out to determine which horses were the most proportionate and most beautiful. Unlike Blundeville, he argued that the Edenic horse would be recreated by the careful, racial mixing of hot and dry Turkish or Barb stallions with cold and wet English mares. The combination of the humoural mixes of hotter and colder climates would lead to a new balance manifest in a perfectly shaped horse. 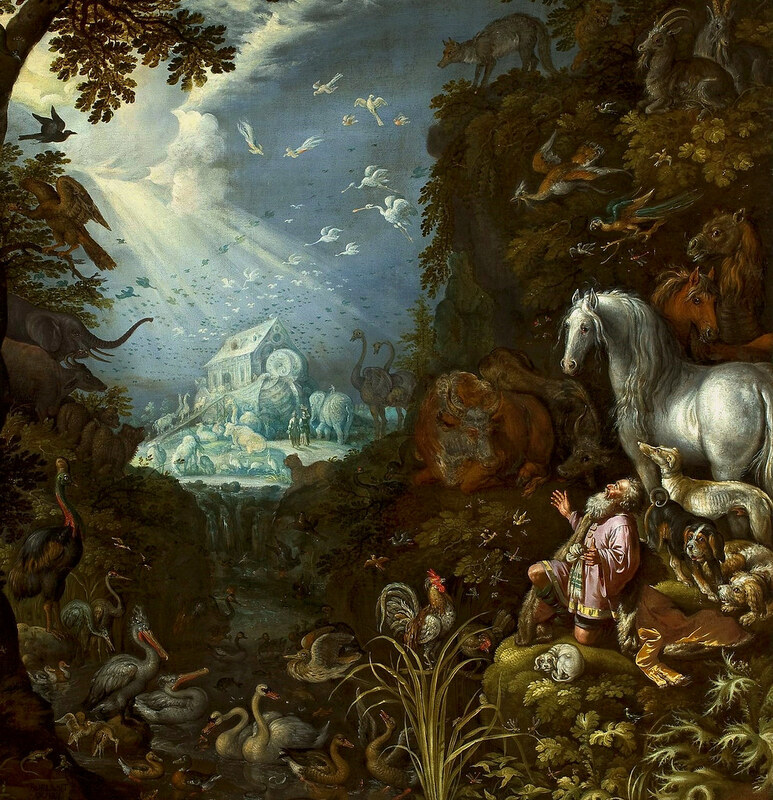 Detail from The Entry of the Animals into Noah’s Ark (1613) by Jan Brueghel the Elder — Source. Baret’s suggestions about racial mixing had a large impact on English horsemanship. His contemporaries warmly embraced the idea that English horses could be improved by the injection of foreign blood. The author Gervase Markham imported one of the first Arabian horses, the Markham Arabian, during these very years, and he sold it to King James I. One hundred years later, renewed imports of Turks, Barbs, and Arabians led to the establishment of the English thoroughbred, which would remain the most valuable British horse into the present day. While early modern Englishmen increasingly protected their national identity by refraining from marriage with foreigners, they had no such compunction about having their mares bear children from stallions of distant lands. Baret’s example has revealed the practical impact of artistic theories of proportion on contemporary breeding practices. Such a story shows that breeders and horse aficionados didn’t merely marvel at the skills of artists in producing naturalistic images. They also seriously engaged with the geometrical underpinnings of contemporary art theory and used these theories as a blueprint for their eugenic design. Moreover, the reception of proportional theory among horse breeders might also find a resonance with the original context in which artists like Dürer, Passe, and Lautensack operated. From the vantage point of Baret, Dürer’s renowned print of Adam and Eve, with its perfectly proportionate humans, is a most appropriate manifestation of the ideal beauty of humankind before the Fall. Just before they have eaten from the apple, Adam and Eve still have a perfect internal balance of the four bodily humours (which, as some claim, are symbolized by the ox, rabbit, elk, and cat in the foreground). That is why their external proportions are so perfect, a characteristic that no other human will ever have, again. 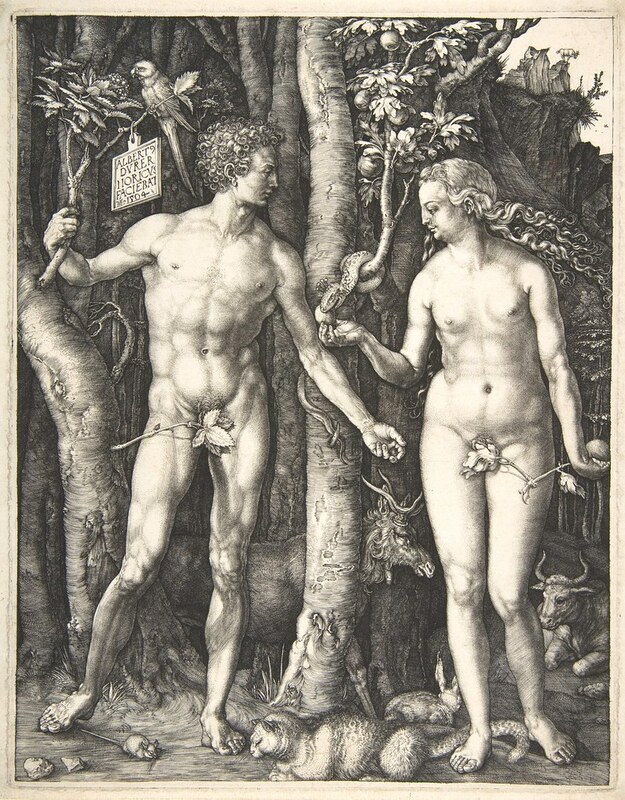 Adam and Eve (1504) by Albrecht Dürer — Source. Dániel Margócsy is university lecturer at the Department of History and Philosophy of Science at the University of Cambridge. He is the author of Commercial Visions: Science, Trade, and Visual Culture in the Dutch Golden Age (University of Chicago Press, 2014) and has just published, with Mark Somos and Stephen N. Joffe, The Fabrica of Andreas Vesalius: A Worldwide Descriptive Census, Ownership and Annotations of the 1543 and 1555 Editions (Brill, 2018). He can be followed at his website or on Twitter @margocsy. ‘t Light der teken en schilderkonst (1643), by Crispin van de Passe. Dises buchlein zeyget an und lernet ein maß oder proporcion der ross (1528), by Hans Sebald Beham. Deß Circkelß vnd Richtscheyts, auch der Perspectiva, vnd Proportion der Menschen vnd Rosse, kurtze, doch gründtliche vnderweisung, deß rechten gebrauchs (1618), by Heinrich Lautensack. Essays collection investigating how animals – horses, dogs, pigs, hogs, fish, cattle, sheep, birds, rhinoceroses, even sea-monsters and other creatures – served people in Europe, England, the Americas, and Africa to defend, contest or transcend the boundaries of early modern identities. Collection of essays filling an important gap in the analysis of early modern history and culture by reintroducing scholars to the significance of the horse. An unusual collaboration among distinguished art historians and historians of science, this book demonstrates how printmakers of the Northern Renaissance, far from merely illustrating the ideas of others, contributed to scientific investigations of their time.